Home » Socialway Blog » How is Data revolutionising marketing and sales? See the full video presentation. See the presentation in powerpoint. Read the transcript of the video presentation. Thank you for being here today, on a national BBQ day! 🙂 I think George stole my joke. I will talk about how data is revolutionizing marketing and sales. So, I will mainly discuss about marketing and sales. Do we have any marketing or sales people in the room? … We have a few… Three, four, okay. This presentation comes to you from Socialway and Zebra Consultants. I am a managing partner at Socialway, a Digital Marketing Agency and a Google partner since 2014. I am certified Facebook Buying Professional and also serve as lecturer and coordinator of the Digital Marketing diploma at Cyprus College. I have more than 10 years of experience in Digital Marketing and I manage to work with a variety of companies both locally and globally to assist them utilize digital marketing tools and techniques to achieve their business goals. I will touch four of the main pillars of marketing and sales and how data help us revolutionise the operations of each. I will talk about market research, marketing strategy, about advertising targeting and about evaluation of our marketing campaigns. When it comes to market research internet give us a plethora of tools to use and get data about our audience. Some of those tools and basically one of my favourites is Facebook Audience Insights where you can log in and select the country and demographic information and you can see how many people are active on Facebook with this information. And of course those people as basically all of us gave the consent to Facebook to use these information. We have google trends, also a public tool that you can make your research on what people are searching for a period of time in a specific industry, so you can do a deeper research of what people are searching and thinking about your industry. The advertising platforms that are available online from LinkedIn, Facebook, Google, Twitter gives us the ability to sort and define specific target audience with specific demographics and specific interests and behaviors. And the last and most obvious, are the search engines such as google that we can search and find information. Other that google we can also search in platforms such as twitter or instagram with specific hashtags that are relevant to our industry and we can see what conversations are around this subject and what is the volume of the conversations, so we can get a feeling of what people are talking about our market. So, for the matter of this presentation I contacted a research looking for female, between the ages of 29 and 45 that are interested in beauty and make up. And I wanted to see these information in UK and I see that there are 5 to 6 million people that have these demographics and interests, 3.5 to 4 million in France and 100 thousand to 150 thousand in Cyprus. We keep this data and we gonna use it in a while. To be able to present a marketing strategy I created a scenario for a cosmetic store. So we have a cosmetic store that sells makeup and the marketing department comes with this amazing idea that the main character of the movie, our hero, gets a professional makeup as a gift from her friends the day before she goes out with her boyfriend that he decided to propose to her. Of course everyone gets emotional, girl are crying, all the procedure is documented and this goes online and gets viral and of course our girl that has the professional makeup has the perfect makeup, for the perfect selfie. So, how are we going to use this and integrate data to achieve our business goals? This is a classic marketing strategy, where we take our content out, so we get our video out to achieve brand awareness and then we get engagement with the brand and then we get lead generation with the consent of the people and then we get conversions. So how we integrate data? 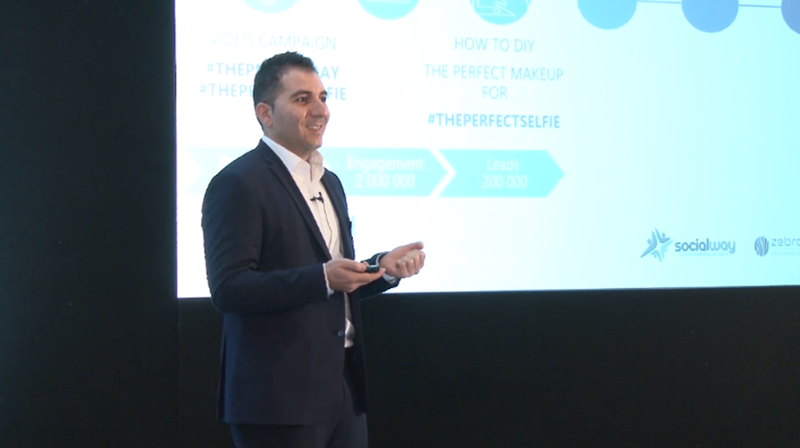 We start as a first step, with our video marketing campaign and the hashtags #ThePerfectDay and #ThePerfectSelfie and we try to reach the 10 million people that we define before in the UK, France and Cyprus. So, we achieve to get for the matter of this example 2 million people engaged with the brand. What we are allowed to do on Facebook and other platforms is to create custom audiences. So we can now create an audience of people that engaged with our video and the people that viewed a percentage of our video. Maybe this is 25%, 50%, 75%. So now we have smaller audience which we know for a fact that took a step further and engaged with our brand. What we do with that? We create as a marketing department the perfect guide so everyone, every girl can do the perfect makeup at home and we offer this guide to the public with the only requirement that they have to submit their information and of course, accept the terms and conditions and all the GDPR consent to download the guide. And of course the girls do it because they want to have the perfect makeup at home. So, now we get 200 000 leads and their information from our targeted audience that are ready to accept future marketing campaign from us. So, what do we do now? Any suggestions? The marketers in the house? How to utilize these 200 000 audience that they already engaged with our brand and we already taught them how to do the perfect makeup? And we know that most likely don’t have all the products needed to do the perfect makeup at home. Sell them now we can sell them. Now we create the limited edition package “#ThePerfectSelfie” and we can go to the evaluation meeting and fall in love with our Data, because now we no longer talk about impressions, views, clicks and likes but we talk about sales, leads and revenue. And this is one scenario on how data is revolutionizing how we do marketing and sales. And of course we continue to optimize our campaign and continue forward. This is a perfect scenario, a fairytale, we have weddings, we have proposals, we have makeups and beautiful stuff… but what happens when it comes to a consulting firm? When we have a blank page? No proposals, no wedding rings, no productions. I am gonna take a step back and go from the beginning to the market research. We need to start with our market research, to define our audience, create our content plan, which maybe is not a very well filmed video but maybe it will be a blog, information, infographic, news about the industry that our customers and potential customers are interested in. Since we have first laid out our plan, then it’s very critical to do a web and social media audit to make sure that the people that we attract to see who we are they get the feeling that we are the people and we are very serious on providing that service. So we move to the marketing strategy and we start creating the marketing campaigns on the internet, on social, on search which is very very effective for B2B marketing, when people are searching for our services and of course loyalty marketing with the respect of the data of our customers. Then we move forward collecting again the people that interacted with our digital assets such as visitors of our websites, people that interacted with our social content and we start running campaigns to reach our goals to gain leads and gain conversions which means clients or sales if we have a digital product to sale. And again we move to the evaluation of our campaign, we see what it works and what not and we optimize the campaigns to move forward. So that was about the marketing strategy. How we use data for advertising targeting? I believe I cover most of those factors, demographics, interests and behaviors that we use every time we launch a campaign. I cover custom audiences which are people that interacted with our digital assets and if we take a step further, we can create lookalike audiences. Lookalike audiences are similar audiences to our custom audiences and are very effective for international marketing. For example if we have a custom audience of 20 thousand people interested in beauty and makeup in Cyprus we can create a lookalike audience in Lebanon with the same behavior of those initial custom audience. I hope this is not very scary and not get arrested by Europol after my presentation ( 🙂 ), but all those that I am mentioning are tools given by the big data companies which the users gave the consent to use this data. And my last part of the presentation is how you use data for evaluation and of course we can get from our advertising reports the impressions, the clicks, the views, the engagement to evaluate. We can see on our analytics tools of our websites, the demographics of the audience that visit our website, the acquisition meaning where they came from and the behavior meaning what are they doing online. And going forward we can measure goals such as download a pdf on our website or register at our website and then we can create campaigns to achieve those goals, leads and conversions. Last one, attribution is a very interesting parameter because we can connect our campaigns with our goals, leads and conversions and we can see how many – if we have let’s say 1000 conversions we can see how many came for each marketing service. We can see that we have 10% coming from Facebook, 50% coming from Google and 40% coming from LinkedIn. And then we can optimize the campaigns to change the rate or move our budget from one medium to another. Before I close I just want to say that basically custom audiences and the information that we get are anonymous so we know that we have an audience of 50 thousand people but we don’t know who they are, so they don’t tell us the actual personal information of a person but we know that we have a specific amount of audience that has that specific attributes. Consumers want to go online and share their experiences with their friends and their families and their associates. It’s up to the companies to respect the data and use it wisely so they can keep promoting and use it for marketing and sales purposes. Would you like to know how is Data revolutionising marketing and sales for your company? Contact us to discuss your business objectives and craft a tailor made Digital Marketing strategy. Leave your contact details below and we will contact you soon.